Ahiara, Nigeria, Feb 19, 2018 / 11:13 am (CNA/EWTN News).- Pope Francis accepted the resignation Monday of a Nigerian bishop who had been rejected by many of the priests of his diocese since his appointment more than five years ago. In June 2017 Pope Francis met with clerics of the Diocese of Ahiara and demanded that they accept the bishop appointment that had been made, or face suspension and loss of office. In accepting Bishop Peter Okpaleke's resignation Feb. 19, Pope Francis chose not to take action against the clergy of Ahiara, saying they have since expressed repentance. At the same time, Pope Francis appointed as apostolic administrator sede vacante et ad nutum Sanctae Sedis of Ahiara Bishop Lucius Ugorji of Umuahia. Bishop Okpaleke's resignation letter was sent to the Vatican Feb. 14. Okpaleke was appointed Bishop of Ahiara in December 2012 by Benedict XVI. However, the Ahiara diocese is dominated by the Mbaise ethnic group, and as an outsider from the nearby Diocese of Awka, Okpaleke was rejected by much of Ahiara's clergy and laity, who wanted one of their own to be appointed bishop over them. The Mbaise are among the most Catholic of Nigerian peoples, with 77 percent of the diocese's population of 670,000 being Catholic. Nearby dioceses range between 19 and 70 percent Catholic. However, Awka, Bishop Okpaleke's home city, is located in the state of Anambra. Ahiara, on the other hand, is located to the south in Imo state. The Mbaise have often asserted that the Nigerian hierarchy favors Anambra. Many members of the tribe resent what they call the “Anambranization” of the Church in southeast Nigeria, believing there to be corruption within the Church in Nigeria and a “recolonization” of the Mbaise. The Mbaise also have a high number of priestly and religious vocations, many of whom end up serving as missionaries in Western nations. The diocese has seen at least 167 priestly ordinations since its establishment in 1987. Because of this, many had hoped that one of their own would fill the two-year episcopal vacancy in the Ahiara diocese. After Bishop Okpaleke's appointment, his Mbaise opponents blocked access to Ahiara's cathedral for his episcopal ordination, forcing the prelate to instead be consecrated and installed outside his new diocese, at Seat of Wisdom Seminary in the Archdiocese of Owerri, May 21, 2013. In July 2013, shortly after his election, Pope Francis named Cardinal John Onaiyekan of Abuja as apostolic administrator of Ahiara in a bid to resolve the problem; however, the effort proved to be unsuccessful. In his letter of resignation, Bishop Okpaleke remarked that the situation in the Ahiara diocese “unfortunately … to the best of my knowledge has not improved.” He has remained in Awka since his espiscopal consecration. 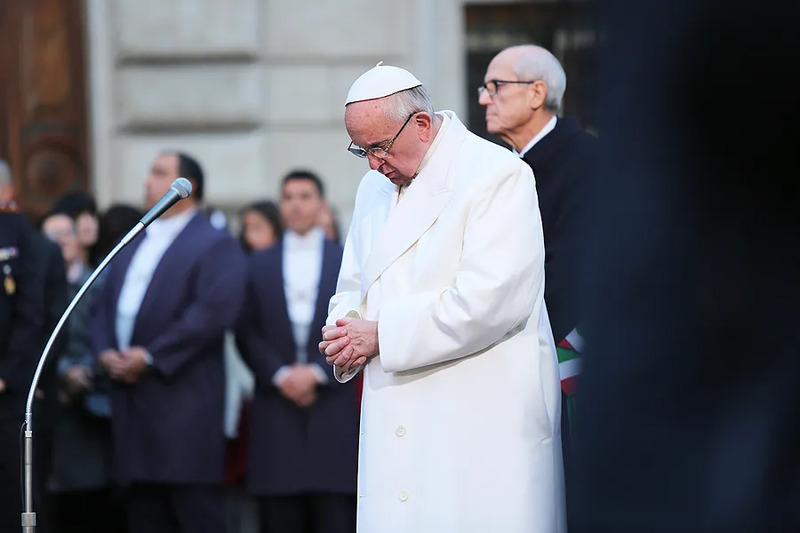 The Congregation for the Evangelization of Peoples said in a Feb. 19 letter to Archbishop Ignatius Kaigama of Jos, president of the Nigerian bishops' conference, that Pope Francis had received 200 letters of apology from clerics of the Ahiara diocese. The congregation responded to each priest who wrote. In a Feb. 14 pastoral letter, Bishop Okpaleke characterized opposition to his appointment as a “Refusal to give the Holy Spirit a chance” and announced his decision to offer his resignation. In a Feb. 19 statement, the Congregation for the Evangelization of Peoples confirmed that in their letters expressing “obedience and fidelity”, some of the Ahiaran priests who wrote to Pope Francis also said they would have “psychological difficulty” in collaborating with Bishop Okpaleke after years of conflict. Juba, South Sudan, Nov 27, 2017 / 07:00 pm (CNA/EWTN News).- The Catholic bishops of South Sudan urged Catholics to join Pope Francis in a prayer for peace in the newest African country, which has been entrenched in a three yearslong civil war.